Microsoft Publisher 2016 helps you create, personalize, and share a wide range of professional-quality publications and marketing materials with ease. Create dynamic publications in very little time when you insert and customize prebuilt building blocks of content, both built-in and from the Publisher community, directly from Publisher 2016. Choose from an array of page parts-such as sidebars and stories-as well as calendars, borders, advertisements, and more. Use professional-looking effects for text, shapes and pictures, including softer shadows, reflections, and OpenType features such as ligatures and stylistic alternates. You can even use Publisher to search your online albums on Facebook, Flickr and other services and add pictures directly to the document, without having to save them first. Import all your pictures to a single canvas, and swap them in and out of your design with a simple drag and drop. With Publisher 2016, you can easily communicate your message in a variety of publication types, saving you time and money. Whether you are creating brochures, newsletters, postcards, greeting cards, or e-mail newsletters, you can deliver high-quality results without having graphic design experience. 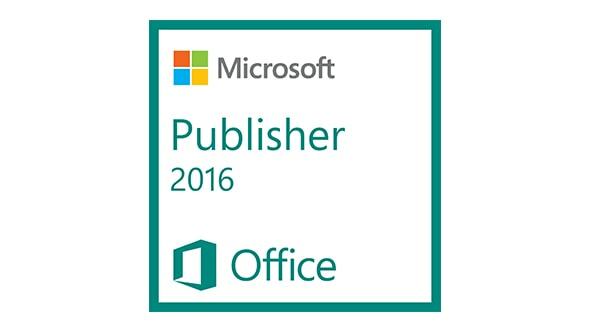 Get the job done right the first time with Publisher 2016. Use improved picture-editing tools-including the ability to pan, zoom, and crop your images and picture placeholders-that make it a snap to replace images while preserving the layout of your page. Design and reorganize pages like a pro with new object alignment technology -- visual guides to help you effortlessly align and position your content. View a full-page print preview with a host of page layout tools and adjustable print settings with the new Backstage view.